HMV have included local band White Lies in their top 10 tips for 2009. The three piece band who have been likened to Echo & the Bunnymen and Interpol were amongst the artists expected to be seen breaking through in the next 12 months. 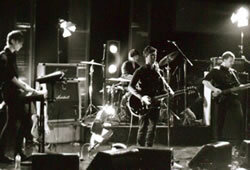 Previously HMV's list predicted the success of Franz Ferdinand, Arctic Monkeys and Duffy. Made up of Harry McVeigh, Charles Cave and Jack Lawrence-Brown, White Lies, formerly known as Fear of Flying, have released two singles, "Unfinished Business" and "Death". Their debut album, To Lose My Life..., is scheduled to be released this month. 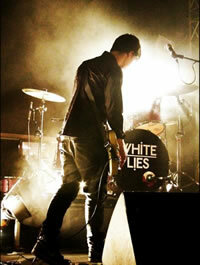 The band, once described by Charles Cave as a "weekend project", the newly named White Lies played their first gig at Hoxton Square's Bar & Kitchen on 27 February 2008 which got them numerous record label offers. They eventually signing to Fiction Records. When asked about their name, the band said they chose the name because "white lies are common but quite dark, and that's how we see ourselves". They made their television debut on Later with Jools Holland on 30 May 2008, at Radio 1's Big Weekend on 11 May 2008 and at numerous UK and overseas music festivals, including major festivals Oxegen, T in the Park, and the Reading and Leeds Festivals. "From the Stars" appeared as iTunes'"Single of the Week" on 30 December 2008.